Each Respect Code of Conduct explains that action can be taken for breaking a Code, so these are understood from the outset. Your member clubs have two main responsibilities around the Codes: 1. To ensure everyone within the club, whatever their role, has read, agreed and accepted their relevant Code – and understood the actions which could be taken if Codes are broken. 2. To deal fairly and consistently with anyone who breaks ‘their’ Code. The Charter Standard Clubs in your league should already have their own club Codes of Conduct, so we would recommend that Charter Standard Clubs look at the Respect Codes and see if there is anything missing from these. They may want to replace the previous codes with the new Respect ones, or they may want to add some of the lines from the Respect Codes to these. It is not advisable to use both sets of Codes as this could be confusing. The important difference is ensuring your member clubs – and through them their own members – understand and appreciate what can happen if Codes are broken. That way, there should be no subsequent debate because they didn’t understand the consequences of breaking a Code. If a club hasn’t used Codes of Conduct before – or has Codes without consequences – this needs discussion, so they understand how the Codes work and what their responsibilities are. It is important everyone behaves themselves when playing football. As a player, you have a big part to play. That’s why The FA is asking every player to follow a Respect Code of Conduct. Talk to someone I trust, for example my parents or the club welfare officer if I’m unhappy about anything at my club. We all have a responsibility to promote high standards of behaviour in the game. In The FA’s survey of over 37,000 grassroots participants, behaviour was the biggest concern in the game. This included both the abuse of match officials and the unacceptable behaviour by over competitive parents, spectators and coaches on the sidelines. 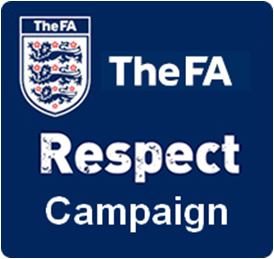 The FA’s Respect programme is aimed at tackling unacceptable behaviour across the whole game. Play your part and observe The FA’s Respect Code of Conduct for coaches, team managers and club officials at all times. We all have a responsibility to promote high standards of behaviour in the game. The behaviour of the match officials has an impact, directly and indirectly, on the conduct of everyone involved in the game – both on the pitch and on the sidelines. Play your part and observe The FA’s Respect Code of Conduct for Match Officials at all time.